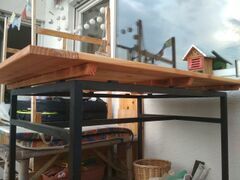 A small outdoor table for the balcony made from slats of douglas fir. 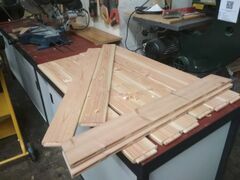 Routed mortises with a Handheld Router. Created the tenons by routing them along the long edges and cutting them with the Bandsaw along the short edges. 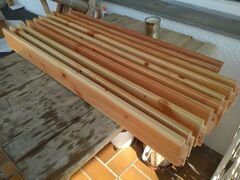 Impregnated the slabs with Halböl (50% boiled linseed oil, 50% white spirit). 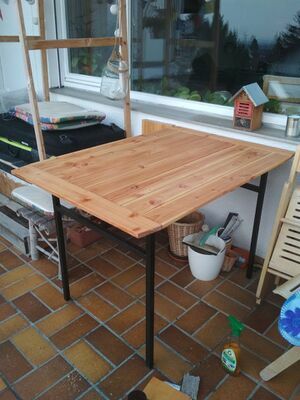 The linseed oil intensifies the wood color. Glued the slabs together and screwed perpedicular slabs underneath for stability. Screwed the finished tabletop onto the metal frame of an old table.